It has been 48 years since Jack Nicklaus won his first British Open on July 9, 1966, at Muirfield, Scotland, then joining Gene Sarazen, Ben Hogan, and Gary Player as the only golfers to win all four of golf’s modern major championships to achieve the career “Grand Slam.” It was Nicklaus’ most elusive victory—following the Golden Bear’s victories in the 1962 U.S. Open, the ’63 Masters and PGA Championship, and the ’65 Masters. The victory was so meaningful to the Golden Bear that he was inspired several years later to name his Ohio home club Muirfield Village Golf Club. Coming down the stretch in the final round of the 1966 Open Championship, three players were in contention for the Claret Jug towards the end of the Championship: Dave Thomas, Doug Sanders and Nicklaus. Thomas was the first to tackle the 17th hole, a long par 5. Thomas and Sanders both settled for pars at the 17th, so Nicklaus required two 4s to win. The Golden Bear recorded a birdie 4 and par 4 at the last two holes to finish one stroke ahead and seal his first victory. Nicklaus followed up his ’66 victory with Open Championship wins on July 12, 1970, and July 15, 1978, illustrating his remarkable consistency and the longevity of his game. In a 15-year spell from 1966 to 1980, he won the title three times, finished runner-up seven times, and was never out of the top six. Other extraordinary Nicklaus stats: From the 1970 British Open through the 1978 British Open, he finished in the top 10 in 31 of 33 majors. In the two in which he didn’t, he tied for 11th and 13th. With five top-5 finishes in the Open Championship, he shares the record with J.H. Taylor. In his 38 British Open starts, the Golden Bear has had 33 rounds in the 60s. 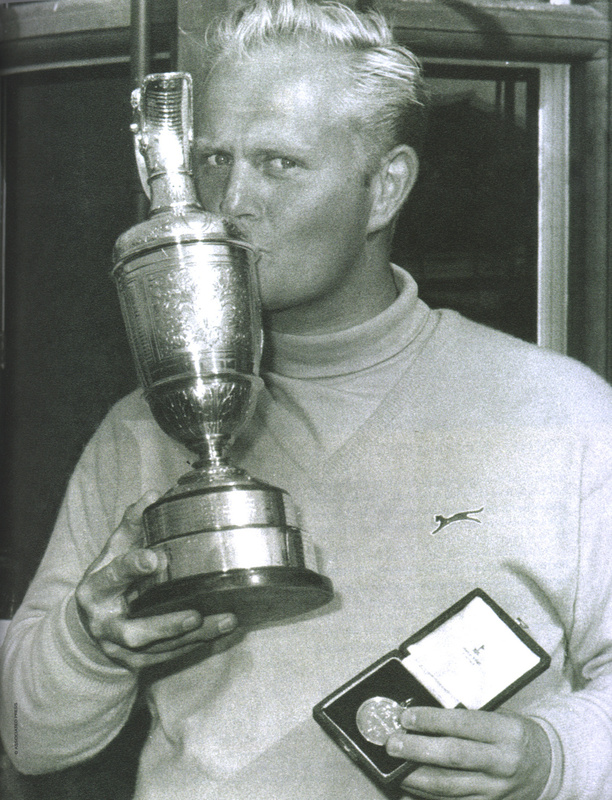 In his autobiography, My Story, Nicklaus reflected on that watershed victory in 1966: “When you have dreamed of achieving something for what seems forever, and it finally happens, and it’s been as hard a grind as that week was (in 1966), so many emotions tumble around in your mind that you’re sort of pleasurably confused and light-headed for a little while. I thought I was over that by the time of the prize presentation. At the trophy presentation, the Golden Bear—typically stoic on the course, but sentimental off it—was overcome. “When the moment came to accept the trophy, the tears began welling up and I couldn’t get any words out,” he remembered. “Being about to receive something that even I, never much of a self-doubter, had genuinely doubted would ever be mine was extremely emotional. Finally, I asked the people to excuse me and to let me just stand there and enjoy myself for a moment. Included in his 38 starts in the Open Championship, Nicklaus finished second in 1967 at Hoylake—site of this week’s Open Championship. Nicklaus mounted a strong challenge halfway through his final round, with birdies at the 7th and 8th holes to go 6 under, leaving Argentina’s Roberto de Vicenzo only two shots ahead. Par for Nicklaus at the 14th was met with a birdie by de Vicenzo, who stayed a step ahead for the remainder of the round. Nicklaus managed a strong finish, with a birdie at the 18th but by this point it was too late. His final-round 69 was good enough for second place, while De Vicenzo finished with a 70, a total of 2-under 278, and a two-stroke victory.